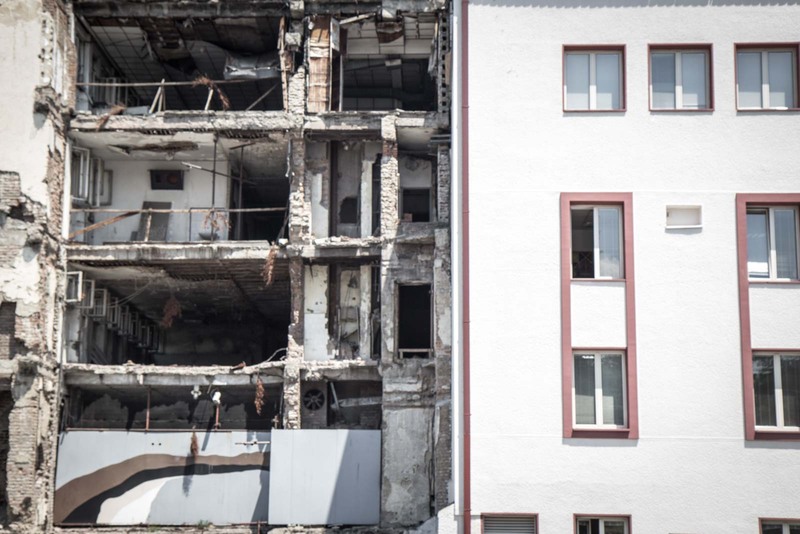 When the bombs rained down on Belgrade in 1999, the city which had seen so much war in its life was suddenly in the crosshairs again. The people of Serbia were brought into the geopolitical machinations of its leadership and, as buildings exploded around them, they felt the full force of a local conflict becoming an international target. Under the banner of NATO, more than a dozen countries were part of the bombings which they say was aimed at stopping the Kosovo War. At the time, there was alleged ethnic cleansing of Albanians in the Kosovo region by Serbian authorities and, despite not having a mandate from the United Nations, NATO believed the correct thing to do was stop any potential war crimes. For two and a half months the attacks from the NATO forces continued across Yugoslavia – particularly in Serbia. Nobody knew where the next bomb would fall. You can only imagine the terror of citizens trying to lead a normal life with American fighter jets zooming overhead. In the larger scheme of global warfare, this happened yesterday and those same citizens still live here. Although it was 14 years ago, Belgrade is still scarred and many parts of the city seem today as though they have just been hit. Physically – and maybe psychologically – the recovery continues. I was just a teenager at the time but I still remember the images on the television and the reports on the front pages of newspapers. Yet, then, it seemed a world away. Where was this strange place called Serbia and why was this area called Kosovo dominating the media? It was of vague interest because I was told it should be but it was not – and has not been – something I gave too much thought to. Not until now as I stand in front of a large building with its windows blown out, concrete hanging from its floors, and metal poles like bones stripped of flesh. It’s one of two twin buildings on either side of the road, surrounded by graffiti-riddled fences, that are the introduction to Belgrade to many people. Just a couple of hundred metres from the main train and bus stations, they are on the road leading into the centre of town. 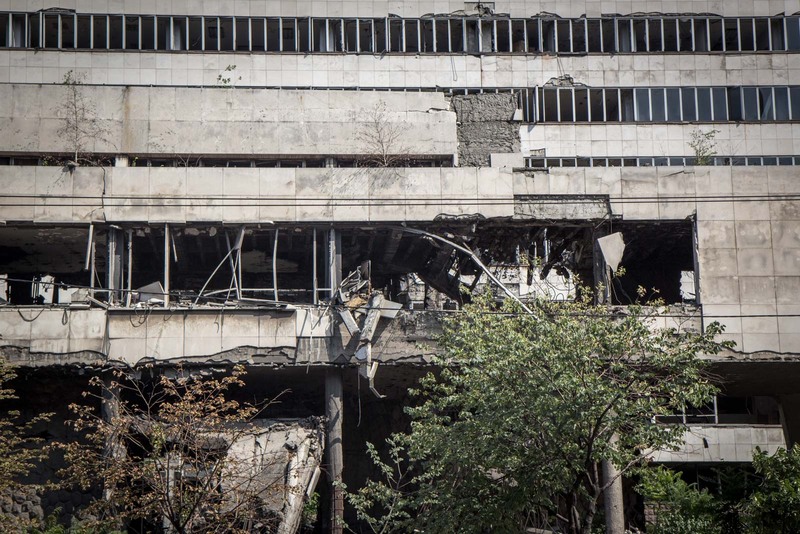 The headquarters of the Federal Ministry of Defence, they were hit by NATO forces on May 7, 1999. About ten minutes walk to the northeast is the main station of the Serbian Radio and Television. It too was hit by the bombing and 16 of its staff were killed. Although a new building was constructed on the site, the ruins have been left where they were – destruction of the past now lives as harmoniously as possible with the present day. In a park adjacent to the buildings is a small memorial to those who lost their lives. In the other direction, again about ten minutes walk from the Ministry of Defence buildings, are more ruins. Although harder to see from the road, they are no less twisted or confronting as the others. The force of the arsenal unleashed on Belgrade was enormous and nothing that was targeted escaped unscathed. That the buildings weren’t completely destroyed is in some ways a more powerful statement than total destruction because the effects are more evident. I do wonder if those effects are now being used against the very forces which created them. Why, after all these years, have these ruins of war not been demolished or rebuilt? I try to find an explanation online but have no luck. Financial aspects may be the answer but I do wonder if it has more to do with propaganda than anything else. In Serbia there were mixed feelings about the regime at the time and the intervention by international forces. But by preserving the evidence of the hostility of foreign forces, it is a constant reminder of a city attacked, the fear of an assault from the air, and the regard in which the West held this patriotic country of Serbia. 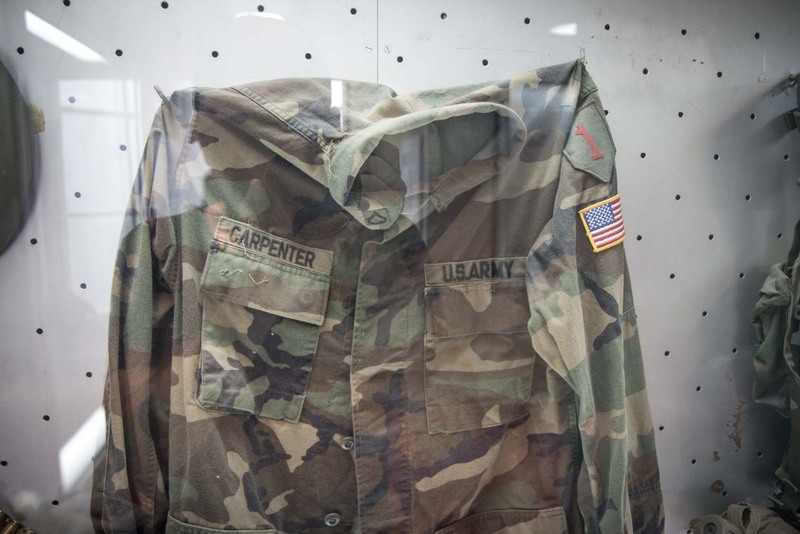 You only need to visit the city’s Military Museum and see these exhibits of NATO equipment, captured during the conflict, to discover an example how the campaign is now being used subtly for public relations. Those who still argue against the NATO bombing claim that NATO – and in particular the USA – constructed reasons to attack. They claim US President Bill Clinton needed a distraction from domestic issues, that it was because Yugoslavia was resisting Western economic reform, and that the scale of any genocide in Kosovo was exaggerated. Then again, the counterview is that the figures were correct and at least 100,000 people in Kosovo had already been murdered by Slobodan Milosevic’s government. The bombings of Serbia and other parts of Yugoslavia stopped the ethnic cleansing and hundreds of thousands of lives may have been saved. Regardless – and I make no judgement myself on this – the effects are inescapable on a visit to Belgrade. 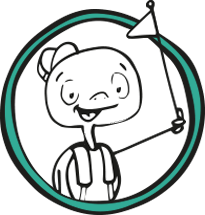 The locals may not want to talk about it and, if it is mentioned, there tend to be oblique references and many looks towards the floor. But that doesn’t mean you shouldn’t try to learn a bit more about it yourself and try to visit some of these sites with a couple of spare hours. 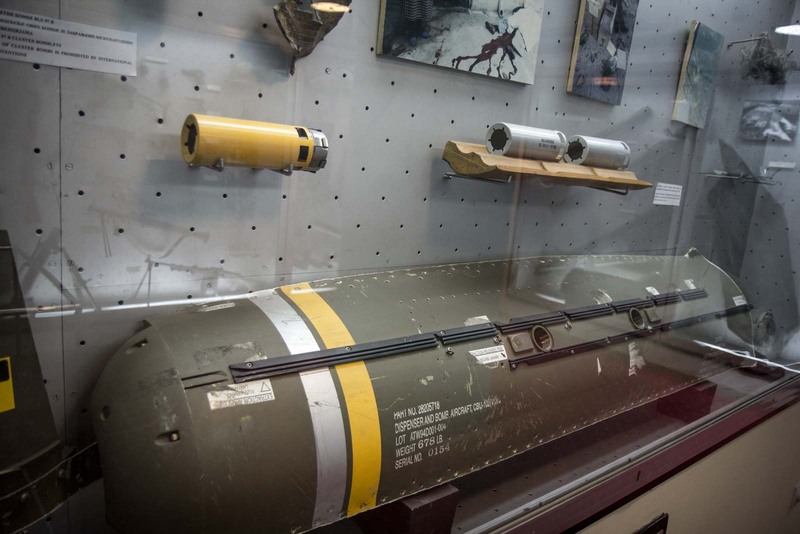 I’m not an advocate of war tourism for gratuitous reasons but an understanding – and firsthand visual experience – of the effects of conflict help put history into perspective. Great post! I love your Serbian entries, keep them coming our way! 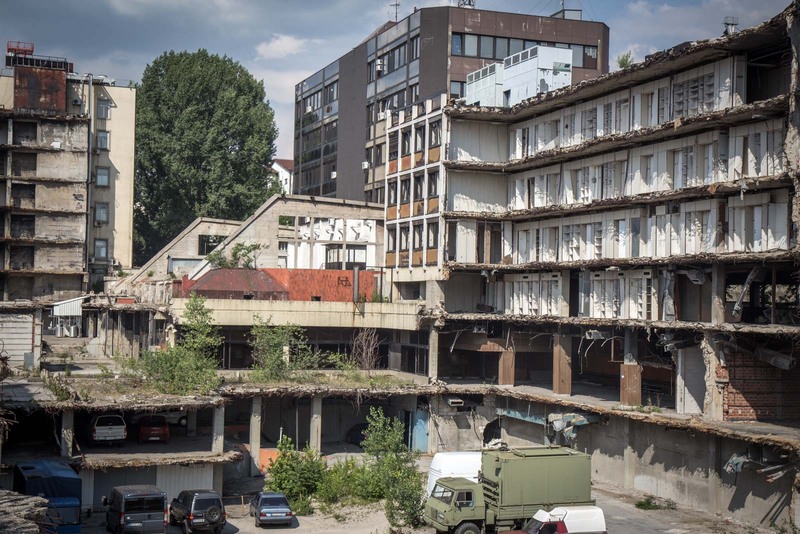 When we were in Belgrade last year we really got the feeling that it was primarily financial reasons that most of the buildings were how they were and having spent time talking to a few locals it’s still quite a touchy subject to mention. In some of their eyes they feel very much the victim and that they were being punished for something they believed was right – and to them – still is. Very unusual, but spectacular place. I find that fascinating that they left it that way. Perhaps it was due to finances? Or maybe a “never forget” kind of a thing. Having just spent a year in Kosovo it became apparent that there were numerous war crimes committed by both sides. In Kosovo today the Serbs are the minority and other than a couple of major towns the towns and villages are segregated. Serbs live in Serb towns and have a shadow government. Albanians live in their towns and while open hostility is not apparent in most places they don’t like each other. In Kosovo, Orthodox churches were destroyed in Serb enclaves Mosques were destroyed and to this day in border towns in Serbia, Albanian monuments and mosques are attacked and demolished. There is nothing to comapre between Serbs and Albanians on Kosovo! First of all – it’s Serbian land riped out by American & EU war crime, bombing of Zugoslavia to support albanians terorists! The destryedSerbian churches are much, much more in number than mosques, (over the 135 churches destroyed AFTER ocuppation of Kosovo 1999, and few mosques destroyed beacuse albanians put the armed terorists and sniper on top of minarets to kill Serbs)! And there is no truth at all in this “I’ll use this contact to hear your opinion and convey to the Serbian people , primarily .” no truth at all! Anyone who is mentioning Srebrenica and Serbian ppl as killers should look for the documentary movie “Srebrenica A Town Betrayed” and “Sarajevo Ricochet”. Both movies are done by Norwegian journalists and facts there are matching what General McKenzie was saying. The reason for NATO bombing was massacare in village called Racak, were allegetly Serbian forces commited massacare on Albanians, but that was not true, those people were KLA terrorists wich were dressed in civil after they were killed in a fight. You dodn`t belive me? Well if that is the case then research about Danish forensic lady who was in charge of investigating those claims, and back then she was under such a preassure that she “comfirmed” alraady writen story about that…. But couple of years ago she went in a media saying that that was false story and that it wasn`t true that there were massacare. Also, you can see videos on youtube from Frensh and German officers, generals who comfirms what I`m talking about. And I know what I`m talking about because I am from Kosovo and Metohija and I`ve seen what was going on. And one more thing for the end, today Serbian goventment, Serbian Orthodox Church, and civilians own over 54% of land in Kosovo and Metohija wich is occupied and now is being sold to Western countries. I think the buildings have been left in their state of destruction mostly due to financial reasons. We didn’t dig too much into it on our visit to Serbia, but we did in Bosnia. Finances are the reason there and I would imagine its the same in Serbia. no, the buildings are still there not because financial reasons, those buildings are there as a monuments and remindner of NATO agression! I know so little about this region, but it really intrigues me. So sad, and so complicated. HQ building is owned by Ministry of Defense and they have no money to reconstruct it. They tried to sell it a few time but no one will buy it since the building is under protection as a building of cultural significance and cannot be demolished. It needs to be reconstructed (at least on the outside). No one will buy the building under those conditions. 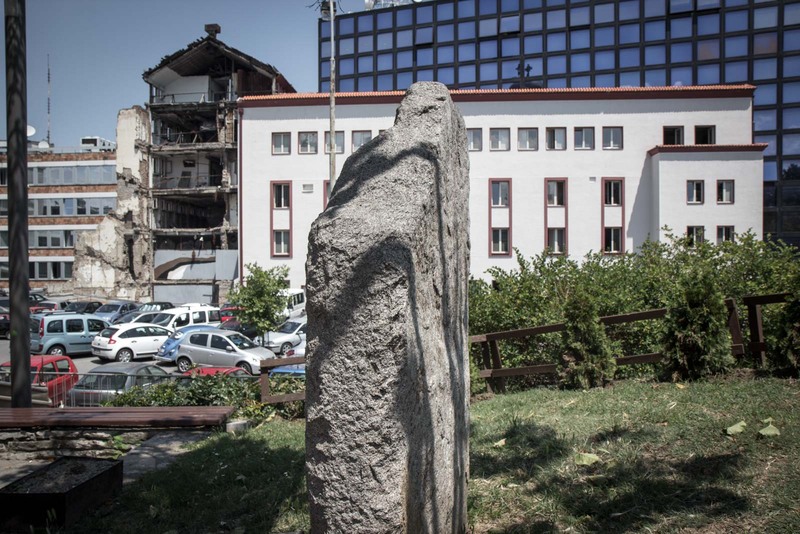 The procedure is underway for the building to be removed from the register of protected buildings but there is a lot opposition to it since it was considered a masterpiece by one of the biggest Serbian architects. I was in Belgrade this past summer and the reason our tour guide gave us for not rebuilding was the same as what Neptun has written about the buildings being on the national registry from before the bombings. Once that detail gets taken care of/removed from the list then they will rebuild. I personally like it as a visual reminder of the devestations of war…also there are several sides to every story. Why NATO/USA didn’t take out Milosevic instead of destroying the infrastructure of a country is beyond me. That’s a good point about the way that NATO handled the targets. You get the feeling it was as much about how things looked to the public. They probably wanted to make Milosevic look like a bad guy rather than turn him into a martyr. No Michael, NATO simply murdered civilians so that they could secure a foothold in a sector of Europe which was previously “un-inhabitable” for the Western powers. As a Serb, I find your article highly insulting; politically incorrect and discriminatory towards Serbs. Your “opinion” is not at all “unbiased”, in actual fact you claim the ruins remain as politically orientated agenda (actually your allusions are unclear but it leads towards Serb nationalism). First and foremost, you need to familiarize yourself with Serbian history – that is our now hotly-disputed area of first settlement: the New American Republic of Kosovo. And MOST importantly, in a visit to Serbia, WHY the negative??? Bombed buildings, Serbian primitivism, Serbian nationalism. Yes, for the Serb, those monuments (as it is what they are – for me, the reminder of those I had lost in both recent wars) should stand there. Something to reflect on and remind us of the aggression. If you visit Belgrade why not reflect it’s beauty to others: Kalemegdan, Knez Mihajlova, Avala, Skadarlija, the cafes, the nightlife, the people. I had a few friends from Serbia who were living in Sofia, Bulgaria during my time there, and the overall feeling is that it’s also being left as a reminder of the atrocities of the past to keep people from making the same mistakes before. That being said, as others have mentioned here, it’s also the fact that these buildings are of cultural significance, and the government doesn’t necessarily have the funds to go in and do a complete remodel. Either way…a stark reminder of the horrific extremes humanity will stoop to once in awhile. WOW – what a sight! I can’t say I’ve ever witness ruins like that. What a powerful image. As paradoxgentleman has mentioned above, these buildings are left as a memorial, not for financial reasons are they rebuilt. Sometimes it is difficult to take photos as security outside do not like tourists doing this and consider it disrespectful. It’s great to read an article that both educates and challenges one to think – It requires further research in an attempt to understand what happened here – and how it is effecting life in the region today. I can’t help but feel for the people, living in a city where they are forever reminded of the events that occurred there such a short time ago. Regardless of whether the buildings are still standing for financial reasons or as a form of propaganda, it must be deeply unsettling to live with constant reminders of war. Very well put. As you can see from the comments, this is a very complicated issue and there’s a lot of thought that can go into it. I can tell you that some people in some parts feel like the war ended just yesterday. And we we’re protecting our motherland from Terrorists, much like America is protecting it’s Citizens from the middle east, if it helps you understand. The difference between those two terrorist wars are that there’s a huge difference in money used in the wars, and the fact that the threat for America was across the Ocean. The threat for Serbia was unpredictable and just behind a border. This article was quite interesting and then at the end dropped in the most spectacular nonsense. Please beware this article is not very accurate and this guys research (chatting to a few people in their second language) is really not very good. I really hope he changes the end of this article as the “100,000” figure is soooo outrageous and misrepresentative on its own. It’s far worse some idiot is actually linking to this blog post as if this is a good article. Do some actual research Mr Turtle, this should be embarrassing for you. Evan, I’ve replied to your other comment further down to address the 100,000 figure. But the short answer is that’s the number that was used by the US at the time when they claimed there was a high death toll, and that’s the point I was making. I agree that the number has since proven to be incorrect. Thanks for this – hope you don’t mind if I link it from my own blog post. No problems at all. Thanks for the link. And I liked your post about the kafana as well. Belgrade is a cool little city once you work it out, isn’t it? I live in Serbia, and those mass murders are Terrorists. They we’re going to fight for Kosovo saying that It’s their Motherland, while we Serbs we’re there from the Middle Ages. America doesn’t understand that, because their biggest History Centers are Swamps and Casinos! In order to understand why NATO bombed Yugoslavia/Serbia a good place to start is viewing old news footage from 1990-1999 of what the Serbian/Yugoslav army and Paramilitary forces did to countless towns and villages across Croatia (e.g. Vukovar, Dubrovnik) and Bosnia (e.g. Sarajevo, Srebrenica). The Serbian political mindset is characterised by megalomania and ultra nationalist irredentism. The shot that triggered a series of events ultimately culminating in the first world war was indeed fired by a Serb nationalist in Sarajevo 1914. The primary catalyst for the violent disintegration of Yugoslavia was Serbian nationalism and its attempt to annex land in Croatia and Bosnia under the pretext of “protecting” Serbian minorities living in those states. According to Serbian nationalist ideology, wherever Serb or Vlach minorities exit, that land is Serbian regardless of the fact that it lays outside the borders of Serbia proper. The current conflict in the eastern Ukraine has many disturbing parallels with events in Yugoslavia circa 1990. After doing more or less nothing to prevent Serbian atrocities in Croatia and Bosnia the West finally realised that the Serbs had to be stopped from repeating their crimes in Kosovo. 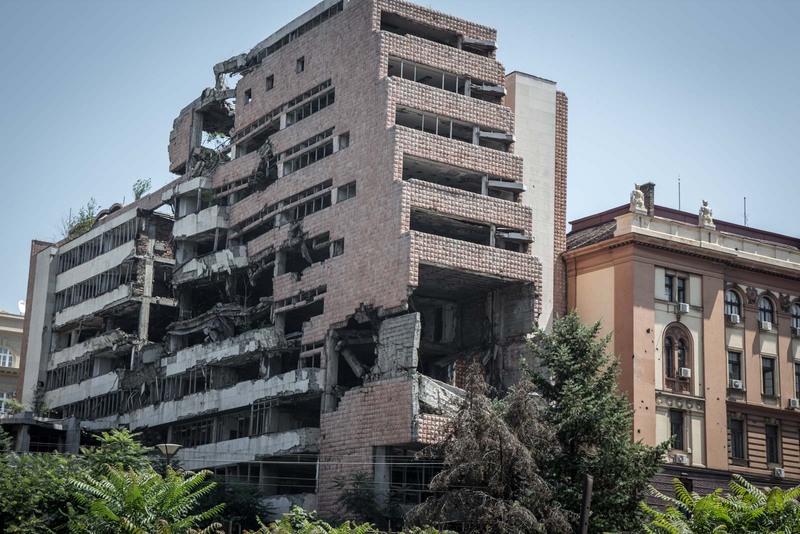 The NATO bombing was completely justified in this respect and succeeded in stopping the Serbian attempt to ethnically cleanse en masse the Albanian majority from Kosovo. 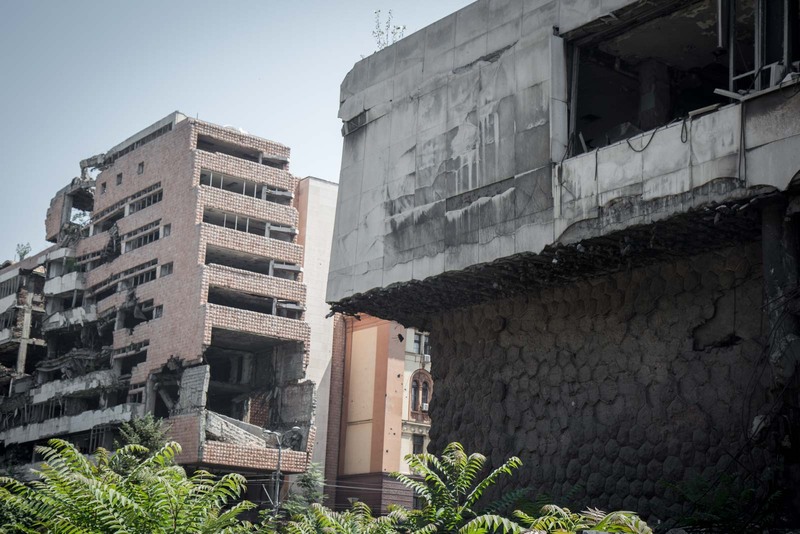 As for the ruins in Belgrade, they will likely remain as they are for the foreseeable future because Serbia is broke. The collapse of Yugoslavia resulted in massive inflows of income generated by the Croatian tourism industry no longer flowing into into Belgrade’s state coffers. Many Serbs to this day lament the collapse of Yugoslavia and the subsequent loss of Croatia and Slovenia, the two richest and most economically advances states which comprised the former Yugoslavia. Thanks for the comment, Martin. I really appreciate you sharing your views and some more background on the issue. Ultimately, I think it’s good for people to do research and make a judgement based on various sources. at the right side in this building i was sleeping in 1991.as a part of Jugoslavian national army, a part of Tito´ Guard.Titova Garda..
we had every morning a physical training..this white from right side is opposite site from first picture which i posted, in other words:our sleeping rooms.this all complex was calling SSNO..Savezni Sekretarijat za Narodnu Obranu i zastitu or The headquarters of the Federal Ministry of Defence…That was in the time that was Jugoslavia,couple months after was beginning of the war.this was Building A,at other side was Building B.Here were all Generals as Veljko Kadijevic general of Army,Blagoje Adzic and all other generals..they were walking beetween us as a normally ´soldiers´. 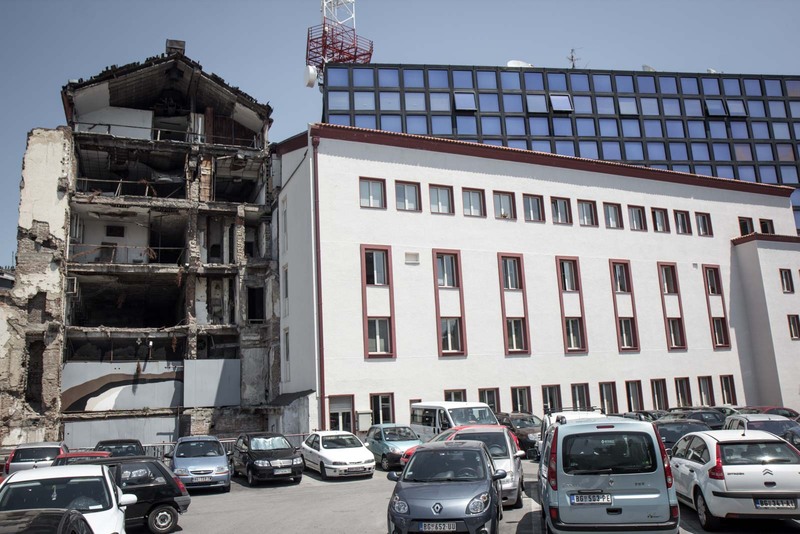 i think we were the last generation that was at this building..
this was important place,part of SSNO .before was here former president Tito,in 1991.was here secretly ´deal´between Croatian president Tudjman and Serbian Milosevic..
Wow – you really were right in the middle of everything. I can’t even imagine what it must have been like for you in those days. It must be strange to still see these buildings in a state of disrepair and think about all the time you spent there – and why you were there! Thanks so much for stopping by and commenting! Can anyone suggest a few sites to visit in Belgrade regarding the Yugoslav wars of 1990s? 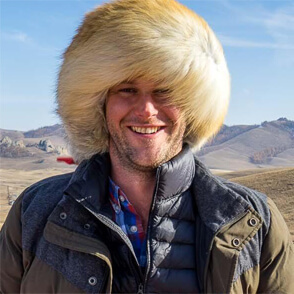 Hi Ryan. I’m sorry I don’t have any more suggestions for you other than what’s in this article. Please let me know if you found some other places and you would like to let other people know! The crimes against the beautiful country of Yugoslavia were planned well in advance regardless of the propaganda the West spills out of its presstitute media whores. At the time, all we heard about was how evil the Serbs were and how good the rebellious other divisions were in the country. Well lets fast forward to 2016, does all this sound familar, the same playbook is, and has been used throughout the middle east and now Syria, and also the demonisation of president Vladimir Putin for good measure. Well guess what, its all out in the open now, particulalry after the wilikleaks leaks against the criminal Clinton dynasty. What happened to Yugoslavia, was a test case for the middle east and any other country that gets in the Wests way. What the West did not tell you at the time of the Bosnian war, was how they let loose all their radical wahabi terror squads, controlled by Saudia Arabia and their American terrorist families. So not only did the Serbs have to fight the Croat Ustache, they also had to fight Izetbegovichs Wahabi terrorists that were let into the country through the ratlines in Croatia. For those that disagree good for you, these are the facts, nothing that is happening in Syria today, did not happen in Yugoslavia. Fcuck Clinton and their neoconservative war criminals, their time is coming and soon. It wasn’t Slobodan Milosevic’s government that was charged. Milosevic was cleared of all charges, after he’d died in custody. He was charged on the theory that he could have commanded the government charged with genocide, the Bosnian Serbs, if he’d wanted to. 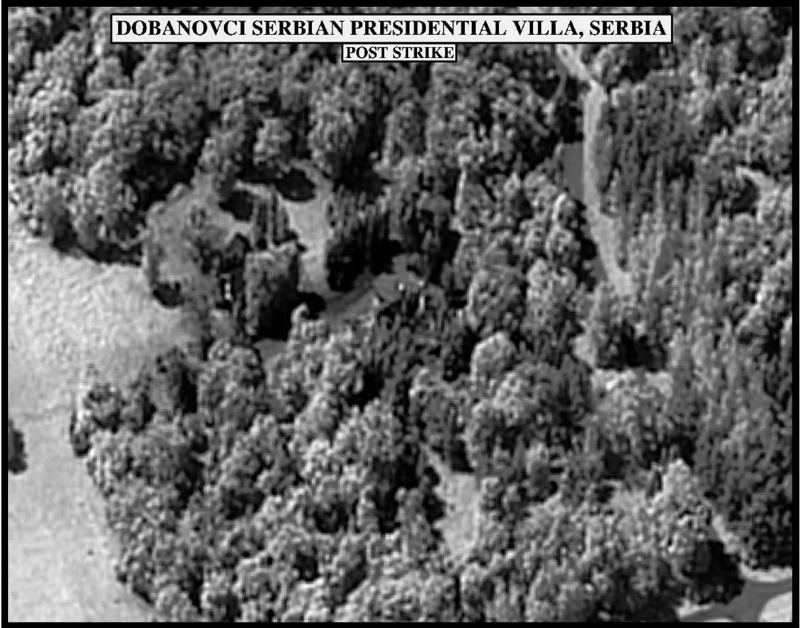 The tribunal found in 2017 that the Serbian government was not responsible for anything done by Bosnian Serbs, which covered everything Milosevic was charged with. One can not expect anything better from satanic NATO. It’s war against Orthodoxy as the rest of Christianity has fallen. Russia and Serbia are the only two countries In the world that have enough courage to fight the evil. We will not sell our soul for miserable pennies and cents. Long live orthodoxy. 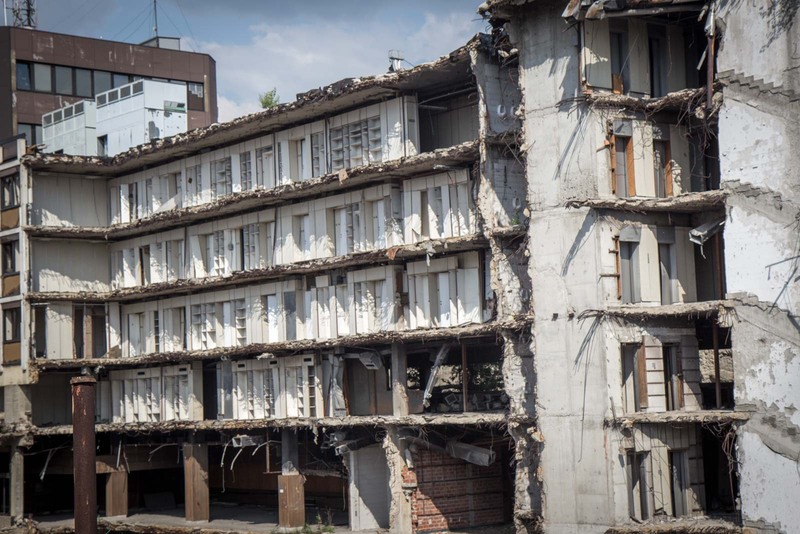 For the record, these buildings are still as they are to this day because it is seen as a “forgive but never forget”… it’s a reminder to all citizens of Serbia what they went through during the 1990’s and to never forget the innocent who’s lives were lost. These buildings have remained this way since the 90’s and will continue to stay they way that they are. this conflict is a perfect reason why the US should stay out of the business of other nations. when we don’t show up, we’re bitched at. when we do show up – we’re on the wrong side. the US SHOULD have just let all the factions in Serbian fight it out for themselves. THEN the blood would be on their hands only. 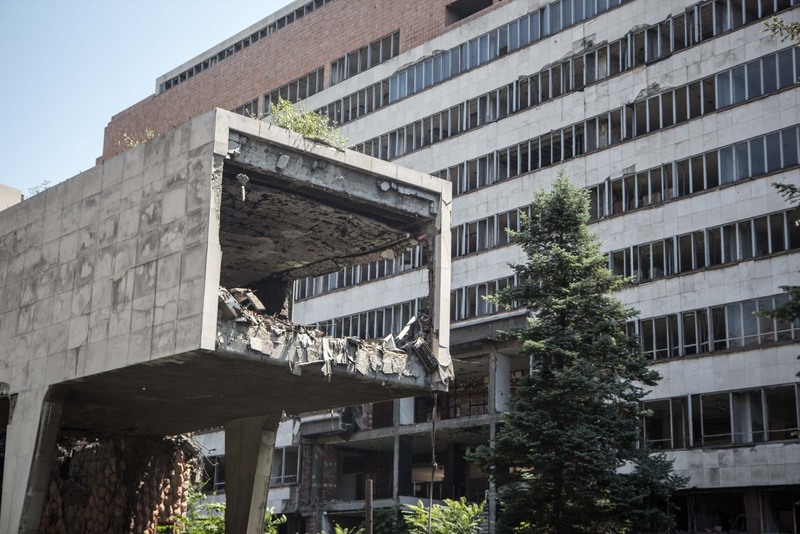 The Serbs should knock all those damaged buildings and not remind the world of the illegal war that was waged against the Democratic federal republic of Jugoslavia by the overt and covert forces of NATO. That proud record extends over the last three decades from Jugoslavia to Afghanistan to Iraq to Libya to Syria. NATO should really stop doing the world favours. I thought you wrote a good post, but where on earth did you get a figure of 100,000 people killed in Kosovo? That doesn’t make any sense whatsoever and I don’t think anyone ever claimed that. Even some of the higher estimates don’t come to 20,000 civilians killed on both sides. I really think it’s a good idea to travel and learn about this part of the world, but throwing around lazy figures is quite reckless. If you want to see some good documentary coverage of this part of history, you can see the BBC documentary on Milosovic on YouTube (I believe one relevant episode is Defiance) and it shows the reality of who was being dealt with at this time. The KLA were a horrible bunch of people, no matter how bad Milosovic and his wife were, and the things they happily admitted to on camera (throwing grenades into police stations, bombings etc) is the tip of the ice berg to how they killed a lot of the moderate Kosovar Muslims to prevent any reconcilliation between the people. It is a very complex and difficult task to possibly admit things were no where near how they were portrayed, but they weren’t. When hundreds of thousands of people were killed in Rwanda and only a few thousand in Kosovo, you only need to look at the aftermath (the nato/US airstrip, hugely valuable mines being taken over) to see what wars are really about. And it isn’t about saving the little guy. I appreciate your comment, Evan. It’s a good question about the 100,000 figure – and one I’m happy to explain. You’ll notice that even in 1999, that number was being questioned. I agree, that with further investigation it turned out that number was nowhere near that high. The point I was making in this article is that there were two very different viewpoints at the time. My main focus in this story is about present day. I follow your blog since 2013. Practically from the days when I started my tour company here in Belgrade. Reading your posts was always inspirational. This article is particularly valuable, because it gives one pretty unbiased overview on the NATO campaign, back in the ’99. Thank you for that.